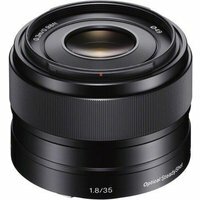 The Sony E35mm f1.8 OSS Lens has been designed for Sony's smaller compact system E mount cameras and is well suited for portraits and general photography, especially in low light. The f1.8 maximum aperture brings the subject in sharp focus whilst creating a soft, natural blur effect for the background. The Optical SteadyShot (OSS) image stabilisation within the lens delivers crisper, clearer handheld shooting at all zoom settings. Designed for Sony APS-C CSC's.